We note with great concern the current policy for South Eastern Europe of the European Commission. The visa policy for the successor states of the former Yugoslavia risks to create two classes of citizens in South Eastern Europe, based on ethnicity. We welcome, that visa-free travel should be granted to citizens of Montenegro, Macedonia and Serbia as of 1 January 2010. Equal rights will, for example, be refused to Bosnia and Herzegovina. The European Commission ignores that Bosnia and Herzegovina and Serbia are almost at the same level with regard to the introduction of bio-metric passports and a variety of legislative acts agreed on the visa liberalisation road map. The arguments which serve to justify the Commission recommendation are factually unconvincing and politically irresponsible. The draft recommendation on visa liberalisation will increase tensions within the fragile post-war societies as the plans of the Commission will formalise ethnic divisions and provide them with dubious legitimacy. Only a part of the citizens of Bosnia and Herzegovina will profit from the new travel regime. Bosnian Serbs and Serbs from Kosovo travel visa free in the EU thanks to their second passport issued by the Republic of Serbia as of 1 January 2010. Bosnian Croats have already enjoyed visa-free travel to the EU for a couple of years thanks to their Croatian passports. Restrictions thus remain in place for the Bosniak people of Bosnia and Herzegovina. De facto, ethnic criteria will decide on whether a citizen is able to travel freely to the EU. This summer, 14 years ago, more than 8,000 Muslim boys and men were killed around Srebrenica. It is evidence of the EU’s poor political judgement that Bosniak survivors and relatives of the killed will be disadvantaged in comparison to the hundreds of suspected perpetrators who committed crimes in Srebrenica and who continue to evade justice. German post-war history reminds us how important the freedom to travel has been for the peaceful development of a society. With the change of the travel laws in the GDR on 9 November 1989 the wall came down. The East and the West of Europe were able reunite. People in South Eastern Europe have the same right to freedom of travel. A region still haunted by nationalism needs freedom of exchange of ideas and opinions and also the right to travel. It is not freedom that creates instability, but the suppression of freedom. The guiding vision of the visa liberalisation policy of the European Union is to bring South Eastern Europe closer to the EU and to promote European reconciliation and cooperation. In the next weeks, the European Commission, the European Council and the European Parliament have the choice between a visa policy that is uniting Europe or one that separates people on the basis of their ethnicity. Hermann Hardt, Flüchtlingsrat Hamburg e.V. Takis Michas, the brilliant anti-fascist Greek journalist, is being sued by Stavros Vitalis, a Greek volunteer who fought on the side of the Bosnian Serb rebel forces during the war in Bosnia and who participated in the conquest of Srebrenica. Vitalis is suing Michas on the grounds that 1) Michas called the Greek volunteers ‘paramilitaries’, whereas Vitalis claims they were members of the regular Bosnian Serb army; and 2) Michas claimed the volunteers took part in the Srebrenica massacre, whereas Vitalis claims they never participated in ‘aggressive operations’. However, in the press conference Vitalis gave, he admitted that he himself had been present ‘in all the military operations’ that were related to the Serb ‘reoccupation’ of Srebrenica. He also claimed that the operations of the volunteers ‘were widely endorsed by Greek society because of the warm friendship that connected Andreas Papandreou with Radovan Karadzic’. Michas is the author of Unholy Alliance, a book that exposes the full extent of Greek support for, and complicity in, the Serb aggression and genocide of the 1990s. His struggle is the struggle to free Greece from the grip of nationalist chauvinism and extremism. This case will be a test case for Greek democracy. The Congress of North American Bosniaks, umbrella organization representing approximately 350,000 American and Canadian Bosniaks, strongly condemns a lawsuit against a respectful Greek journalist, Takis Michas for his writing about the presence of Greek paramilitaries in Bosnia supporting the Serbian aggression. The lawsuit was launched by Stavros Vitalis, a former self-admitted Greek participant in the Srebrenica genocide who claims that the Greek volunteers were there in order to help the Serbs whom he characterizes as the “real victims”. This is of course a false assessment that is being perpetrated with the intent of distorting the truth and contradicts all the historical facts that have already been established by the international courts, including the decision in which Serbia was found responsible for violating its obligation to prevent genocide in Srebrenica. The facts are that more than 8,000 Bosniak men and boys were slaughtered by Serbian forces, including Greek volunteers, simply because they belonged to a different ethnic and religious group. The Congress of North American Bosniaks believes it is incomprehensible that participants in the genocide are not only allowed to walk free, unpunished for their crimes, but they are able to harass highly respected journalists for telling the truth. This is a further insult to injury to all the victims of the Srebrenica genocide and their families. This is simply a case of trying to intimidate journalists, like Takis Michas, from telling the truth and publicly criticizing the Greek involvement and public attitudes towards the Srebrenica genocide. This is not only an attack on free speech but a repulsive attempt at distorting the truth and spreading of hate propaganda that somehow tries to justify war crimes. This also comes at a time when Radovan Karadzic, the former leader of the Bosnian Serbs, is about to face trial for his role in leading and orchestrating the genocide in Bosnia and Herzegovina. It is important that journalists are allowed to express their views on all aspects of the events that took place in the region, so that we can prevent them from occurring in the future. Unfortunately Greek government has not prosecuted those who took part in war crimes in Bosnia and operations that resulted in tragic death of Bosnian civilians, namely around Srebrenica where 8,000 Bosniaks were summarily executed by Serbian forces. As evidenced by the statement from Stavros Vitalis actions of the volunteers “were widely endorsed by Greek society because of the warm friendship that connected Andreas Papandreou with Radovan Karadzic”. Greek government should take steps to apologize to the families of those who were killed, for their role in not doing anything to prevent the spread of hatred towards Bosniaks and for allowing the Greek volunteers to operate freely without fear of being prosecuted for their crimes. Furthermore, we ask of the Greek justice system to throw out the frivolous charges against Takis Michas, and ensure that freedom of the press is upheld according to the standards of the European Union. Mr. Vitalis is one of the leading Greek volunteers who have admitted taking part in the Srebrenica genocide. But, that’s not how he sees it. DANIEL TOLJAGA: Mr. Michas, thank you for agreeing to take part in this interview. To begin with, what is the Panhellenic Macedonian Front that has filed this suit against you through its representative Mr. Vitalis? TAKIS MICHAS: It is a Greek nationalist political organization which also includes socialists and conservative former politicians. Up until now its central campaign theme has been its advocacy of the view that Macedonia along with everything related to it (history, symbols, etc.) is exclusively Greek. DANIEL TOLJAGA: What exactly does Mr. Vitalis hope to achieve with this lawsuit? TAKIS MICHAS: Bearing in mind that Karadzic’s trial will also be taking place next year, what they will be hoping is to create an alternative debate in which the substance of what happened at Srebrenica will be called into question. In other words, while the world is trying the war crimes perpetrated at Srebrenica, in Greece they will be putting the critics of the war crimes at Srebrenica on trial! DANIEL TOLJAGA: Do you have any comments about the lawsuit and the press statements Mr. Vitalis has made? TAKIS MICHAS: Yes. First of all Mr. Vitalis explicitly admits that Greeks (i.e. himself) took part in the planning and execution of the Serb “re-occupation” (as he calls it) of Srebrenica. As he says in his press statement “I was present with a group of senior Serb officers in all the operations for the re-occupation of Srebrenica by the Serbs”. This reinforces the point I have repeatedly made, namely that Greek support for the Serb war effort was not only moral, economic, diplomatic and political but also military. DANIEL TOLJAGA: Was Mr. Vitalis present during and after the fall of Srebrenica when Greek paramilitaries hoisted the Greek flag over the town? TAKIS MICHAS: Well in his own statement he said that together with high ranking Serb officers he took part in all the operations that dealt with the “reoccupation” (as he calls it) of Srebrenica. Now as to whether he was physically present in the hoisting of the flag this is something that only Mr. Mladic knows (and perhaps Mr. Karadzic)! DANIEL TOLJAGA: It is interesting that he publicly admitted being present himself “in all the military operations” related to the “re-occupation” of Srebrenica. Do you have any idea why Mr. Vitalis has not been investigated for possible war crimes? TAKIS MICHAS: Because, as I have shown in my book, in Greece Serb actions during the war in Bosnia are not regarded as “crimes” but as “heroic deeds”. This applies to Srebrenica as well. No Greek government has made any statement at any time during the last 15 years explicitly condemning the killings at Srebrenica – this is a unique state of affairs for a European country. DANIEL TOLJAGA: In the words of U.N. Judge Theodor Meron, who served as the President of the ICTY, Serbs – and I quote – “targeted for extinction the forty thousand Bosnian Muslims living in Srebrenica.” In your opinion, is Mr. Vitalis fully aware that the military operations he took part in resulted in the summary killings of more than 8,000 and the ethnic cleansing of approximately 30,000 people in July 1995? Is he aware that he took part in genocide? TAKIS MICHAS: According to his own admissions, yes. However, just like Holocaust deniers, these people refuse to accept that mass killings took place in Srebrenica. DANIEL TOLJAGA: Your book revealed for the first time the presence of Greek paramilitaries in Bosnia. Why has Mr. Vitalis waited so many years since the publication of your book to file a suit? TAKIS MICHAS: This is an interesting question. Perhaps it has something to do with the fact that as I have hinted in other articles I am now in possession of confidential diplomatic documents that show the Greek authorities for the first time admitting the presence of Greek paramilitaries in Bosnia. Possibly they think that by putting pressure on me now they will prevent me publishing these documents. But this of course is only one explanation. There may be others. 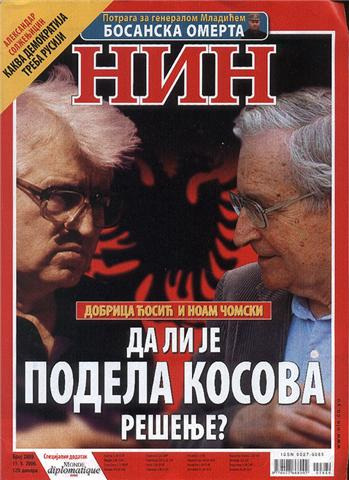 DANIEL TOLJAGA: Mr. Vitalis has claimed that the operations of the Greek volunteers “were widely endorsed by Greek society because of the warm friendship that existed between Andreas Papandreou and Radovan Karadzic.” To what extent did this friendship suggest that the government may have been involved? TAKIS MICHAS: Obviously it involves government in the sense of knowing, tolerating and endorsing the open recruitment of Greek citizens with the aim of fighting against the legally recognized government of Bosnia. It certainly implicates the government of PASOK under Andreas Papandreou. DANIEL TOLJAGA: I remember, and you also referred to this in your book, that leading Greek judges had publicly refused to cooperate with the International Criminal Tribunal for the Former Yugoslavia (ICTY). Considering that your right to a fair trial may be seriously impaired by the extreme ultranationalist atmosphere in Greece and the fact that Mr. Vitalis has announced that he plans to call leading Greek nationalist politicians as witnesses, I would like to know whether you intend to seek support from prominent international organizations that specialize in the protection of journalistic freedom? TAKIS MICHAS: I will certainly be trying to spread the word. Judging from the lawsuit they have filed against me, I guess that from now on they will also be making the glorification of the Serb war effort in Bosnia one of their campaign themes. DANIEL TOLJAGA: Are you worried about the forthcoming trial? TAKIS MICHAS: In any other European country this lawsuit would have been thrown out of court. But as I have said repeatedly Greece is not a normal European country. Given the spirit of extreme nationalism that permeates the country and the fact that Karadzic and Mladic are venerated as saints by the majority of the public and the political class, I have every reason to feel worried. DANIEL TOLJAGA: Thank you for taking part in this interview. We will be keeping a close eye on the progress of your case.